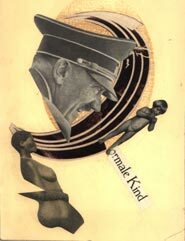 Karl Waldmann, (das) normale Kind Undated Collage on paper. 26,7 17,7 x cm. enfant normal. BRUSSELS, BELGIUM.-Galerie Pascal Polar presents Karl Waldmann and Constructivism, on view through January 28, 2006. Karl Waldmann, born in the 1880s and died in 1958 in the USSR in a working camp, was one of constructivism's last discoveries and undoubtedly a very important one. It is only after the fall of the Berlin Wall that he was rediscovered through 50 of his works bought from a second-hand street dealer. A more thorough search led to the discovery of other works in Germany, Italy, Belgium, France, Ukraine and the U.S.A. Specialists went on to identify close to 900 works, dating from 1915 to the 50s, most of them collages or photomontages. Unfortunately, we know very little about his personal life or his personality, and there are no traces of him in the art revues from his time. His familly, found in Dresden in 1989 and since deceased, contended he refused to exhibit for « mental reasons » - but it was probably more due to « security reasons », during the Nazi years and after that under the Stalinist censorship. Another hypothesis is that he was not purely an artist but had a job as his principal activity - as an architect for example - and devoted his spare time to his artistic creations. In its forms Waldmans art is very heterogeneous, and has never been assimilated to one, unique movement. His early pieces were abstract but very soon his works were influenced by Constructivism, dadaism and even Surrealism. His forms are derived from Constructivism, with the destruction of the classical image in a dynamic vision. Nevertheless, his will to integrate the events of his time into an acid and politicized vision in his photomontages puts him more in line with the dadaist movement. His collages are scathing reactions to the absurd and untolerable policies of men such as Hitler or Stalin. He criticizes the events of his time through political attacks that unveil his exacerbated sensibility and his ironic vision. Consequently he was compared to artists such as Schwitters, Heartfield, Haussmann, but also Rodchenko and Maiakowski. His art involves cinema, politics, literature, theater, developing the themes of the city, machines , actresses. His is a very rich work that has not yet been studied in depth. The first floor of the gallery presents several outstanding works of Russian Art, from the beginning of the century to the Posters of "Socialist Realism". They come from the Bodenschatz collection, gathered in Basel for over 30 years. It is hardly known and yet it includes rare posters by Malévitch: The Loubok, a few works from the beginnning of the century on the Russian loans - some constructivist works, paintings and drawings; and in particular an astonishing and rare choice of the poster artists of Socialist Realism: Ivanov V, Deni V, Miakovski, Malevitch, Filonov, Korovine, Sorionov, Benois, Nicolai, Udalzova, Otrochenko, Korovine Mansourov, Dimitrienko, Efimov Gorskin, Lebedev, Koretsky, etc.